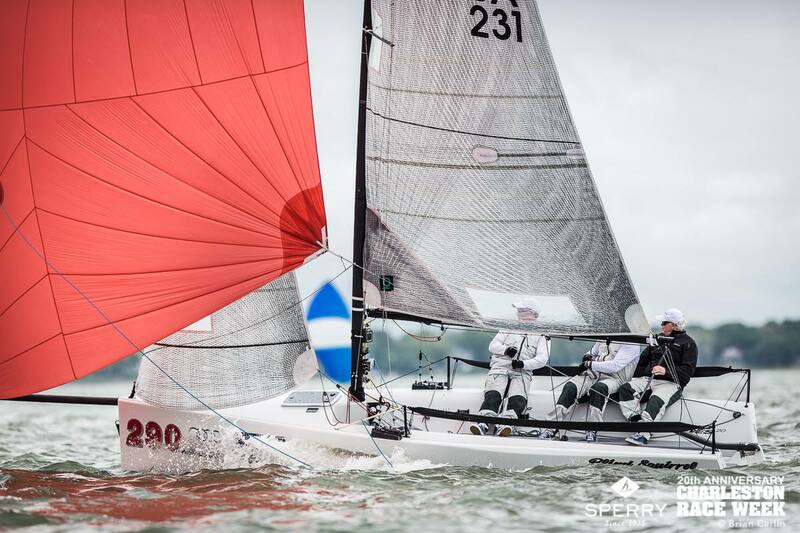 At the 2015 Charleston Race Week, I sailed on a Melges 20, where we had nine races on Course Three. The lessons I learned from that event apply to everybody, so I am passing them along to my fellow one design sailors. On the first race on Sunday, the wind was from 350 at about 6 knots. Current was running from the left of the wind almost parallel to the starting line at about 1 kt. Our game plan was to keep to the left. The reasons for this were that it looked like there was a bit more wind on that side of the course and we thought the current may not be running as strong on the left side of the race course. We got a great start about mid-line with speed. The fleet split in half with about half the boats at the windward end of the line going to the right, and from the middle of the line down going to the left. We slowly got lifted on starboard tack and were in a bit more velocity than both sides of the racecourse. We kept on starboard tack until the boats abeam started to step out towards the middle. We were starting to get headed so we lead the group back. Once on port, our angle didn’t look great but we were leading the left side back and right where we wanted to be. At this point, it looked like about five boats from the right were ahead of us. We started getting headed and joined the majority of the left-side boats and tacked back to starboard. After a few more minutes, the left group getting headed again tacked back to port. The old adage “win your side and hope your side wins the beat” is very true. Even at the top of the beat, stay with your pack all the way to the mark. At worst you stay ahead of all the boats you had. Don’t cross the course unless you have a definite plan or see something that is a game changer. Be Patient. With this much current, the beats took a lot longer so even when you thought you were getting to a corner you really weren’t. So by now, you probably have guessed what happened. We got stuck in the middle and watched boats on both sides of us go around us. The closest boat from the left ended up rounding the weather mark in tenth place. Not great but a lot better than twentieth. This is a hard lesson to learn after a great first half of a leg. I hope this will help you learn from my mistakes and I hope to remember this lesson a little longer for my own use!